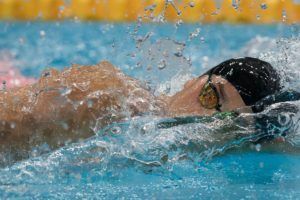 There’s just one session to go in Santa Clara at the 2013 International Grand Prix, and fans will be hoping for a little more life out of the elites in the evening than we saw in the morning, where most of the best swims came from the younger, more upstart generation. Among the battles include the men’s 200 IM, where Conor Dwyer comes in as the top seed ahead of big names like Chase Kalisz and Ryan Lochte; as well as the 100 backstroke, where four Cal swimmers, including Liz Pelton and Missy Franklin, will square off for the women’s title. 29-year old Quebecois Audrey Lacroix led this women’s 200 fly wire-to-wire, and without letting off the gas for the full distance, and ended up winning handily in 2:08.94. That’s her best time of the year, and more significantly her best in-season time since 2009. She had great splits, going 28.8, 32.3, 33.6, and 33.7 to finish the race. That’s similar splitting, just half-a-second faster at each step, to runner-up Jasmine Tosky, who swam a 2:10.89. Elizabeth Beisel reversed a trend and knocked half-a-second off of her prelims swim to take 3rd in 2:12.74. Cal’s Caitlin Leverenz, who really made a lot of improvements to her butterfly last year, was 4th in 2:13.76, and the defending Junior National Champion Michelle Cefal placed 5th in 2:14.11. Also interestingly, Florida/Australian Ellese Zalewski, who is having the best season of her career since coming to the United States, was 11th overall in a 2:13.06. 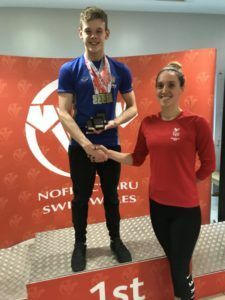 For a swimmer best known as a sprinter, that’s a very good result, and her best time by almost five seconds as compared to entering this meet. In a field of some of the best 200 butterfliers in the United States, including at least three who will expect to final at the World Championship Trials later this month, 16-year old Justin Wright of the Fresno Dolphins reminded America that he was a member of the Junior Pan Pac squad and placed 3rd at that meet last year. Wright put on a big last 50 meters (30.02 split) to not only win the race in 1:57.90, but to actually pass Tom Luchsinger and Tyler Clary with the final touch in sight. That moves him to 2nd on the all-time 15-16 list in this race (taking that position from Dan Madwed – who was in this race). He’s now behind only Michael Phelps in that category. Tom Luchsinger was 2nd in :58.26, and Tyler Clary took 3rd in 1:58.53. 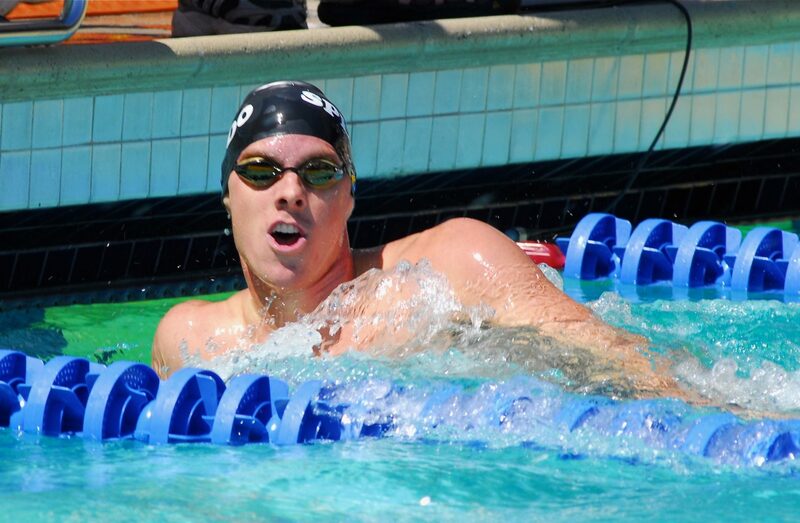 Club Wolverine’s Dan Madwed finished 4th in 1:59.78 and Stanford/Israeli swimmer Tom Kremer was 5th in 1:59.91. Adding in 2:00.0’s from Bobby Bollier and Nico van Duijn for 6th and 7th, respectively, this was a great start to finals as compared to the morning session. Michael Klueh (2:00.32) and Zack Chetrat (2:00.61) also had very good swims to round out that A-Final. Though Breeja Larson, not at this meet, is the defending U.S. National Champion in the race, Hardy continues to make a strong case that she might win the race in Indy this year. She did say after the race that she’s been much more relaxed this year, and spent more time “enjoying life,” but even if she doesn’t get a whole lot lower than this swim, she’s probably still in a good position to qualify for Worlds. Australian Sam Marshall, the only swimmer to get close to Hardy at the turn (out in 31.82), was 2nd in 1:08.00. For the 20-year old, that’s the fastest in-season time of her career, and one of her best period. 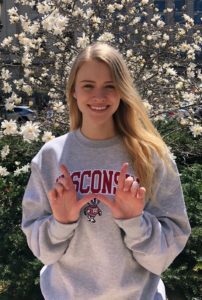 Laura Sogar was 3rd in 1:08.41, and Wisconsin’s Ashley Wanland looked much better than in prelims with a :08.62 for 4th. Jamaican Alia Atkinson took 5th in 1:08.70, and Katlin Freeman was 6th in 1:09.38. Kevin Cordes didn’t make himself the favorite in the world yet for this 100 breaststroke, but he did match his best time exactly with a 1:00.47 and cleared an important hurdle. This is the best field that Cordes has ever beaten in a 100 breaststroke, so his confidence should continue to build. Half-a-second behind him was New Zealand’s Glenn Snyders in 1:00.99, a little bit off of what he swam in prelims, and Brazil’s Felipe Lima, who trains at Davie Nadadores in Florida, took 3rd in 1:01.21. American Mike Alexandrov lost his first 100 breaststroke since the Orlando Grand Prix, finishing 4th in :0.32. Scott Weltz and Clark Burckle were at the back-end of this final in 1:03-lows. 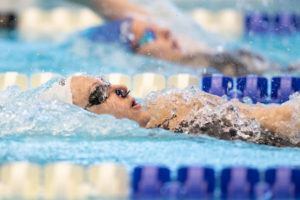 Elizabeth Pelton hasn’t been a best time in the 100 backstroke since 2010 – which is also the last time that she broke a minute in the event, despite making big improvements in several other races. She broke out of that funk in a big way here in Santa Clara, posting a 59.88 for the win. That’s a victory earned ahead of the two U.S. Olympians from last year: Missy Franklin in 1:00.02 and Rachel Bootsma in 1:00.97. If Pelton continues swimming as well as she is at this meet, it’s hard to see her not making the Worlds team somewhere. Australia’s Emily Seebohm took 5th in 1:01.73, and Georgia’s Megan Romano was 6th in 1:02.13. With how well Romano swam in the 100 free earlier in this meet, it seems more-and-more like her future internationally lies in the freestyle, rather than the backstroke, events. Mexico’s Maria Gonzalez-Ramirez, now training in Florida, won the B-Final in 1:02.47. Matt Grevers is tall, but so is Arkady Vyachanin, himself standing 6’6″ in stature. That height held Vyachanin hang tough with the defending Olympic Champion in this event, as the two touched in identical 54.47’s. Grevers hit the turn about three-tenths faster than his Russian (though, sportingly nomadic) counterpart, but Vyatchanin made it up on the back-half. Grevers acknowledged after the race that he was still working on his finish. Stanford volunteer assistant/postgrad Eugene Godsoe was 3rd in 54.69; he was right in this race until the touch, but at only about 6’1, he gave up half-a-foot to the co-champions. Junya Koga took 4th in 54.91 (he’s even more vertically challenged, coming in just under 6 feet) and Australian Bobby Hurley placed 5th in 54.97. Drew Teduits had maybe his first off swim, though only in relative terms, in a while, placing 6th in 55.20. That’s quite a bit slower than he was in Charlotte last month. Jacob Pebley was 7th in 55.22. Ryan Lochte, who was the top seed in prelims, scratched this final. Caitlin Leverenz’s meet has been a conundrum of sorts. She’s swimming so well, and has twice dominated the field in the IM races, but her times still don’t match up to this meet last year where she pulled the double as well. At any rate, the victory in this 200 IM was by almost two seconds, winning in 2:11.87 ahead of Missy Franklin in 2:13.56. Franklin had very good backstroke and freestyle legs, but it’s pretty clear what she’d need to work on to be a true contender in this IM: her breaststroke leg was second-slowest of the A Final. 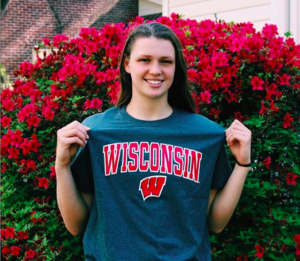 She’s said that her future coach Teri McKeever at Cal really wants to work on her breaststroke over the next few years. Leverenz’s teammate Liz Pelton took 3rd in 2:3.95 for another Cal 1-2-3. Pelton and Franklin swim this race almost opposite of Leverenz. Elizabeth Beisel took a second off of her prelims swim for 4th in 2:14.71, and PASA’s Jasmine Tosky placed 5th in 2:15.85. Annie Zhu had a good swim in the B-Final to win that race in 2:16.29. An exclamation mark to end the 2013 Santa Clara International Grand Prix for Ryan Lochte: he pounded his 4th win of the meet in 1:58.07, jumping him to 7th in the World Rankings this year. There were a lot of really good closing freestyle finishes in this race, but nobody opened like Lochte did. He split 25.2 and 29.1 on the front-half, to turn in a scorching 54.43. That’s two seconds better than runner-up Conor Dwyer (2:00.19) went out, and that was Lochte’s margin of victory. Though the World Record holder keeps improving on his breaststroke every year it seems like, his bread-and-butter is still that first 100 meters. Kyle Whitaker, who trains with Clary in Ann Arbor, Michigan, was 5th in 2:02.83, and Josh Prenot was 6th in 2:02.91. Florida’s Dan Wallace, a British international, won the B-Final in 2:02.55. North Baltimore 17-year old Gillian Ryan said after this swim that she’s supposed to be working on going out harder. That may have been her marching orders, but that’s not how this race played out: Ryan spotted Canadian Alexa Komarnycky a four-second lead going into the last 100 meters, but then ran her down to win in 8:36.49. Komarnycky was 2nd in 8:36.93. The Canadian didn’t have a bad last split – she was 31.86 coming home, which is solid for this time of year. Ryan, however, had a phenomenal one, splitting 29.33 to finish. Remember that Ryan is only two years removed from winning the 2011 National Championship in this race (a post-Worlds title), though the field has gotten significantly thicker since then. North Carolina swimmer Stephanie Peacock, an NCAA Champion who missed that meet this year, was 8:39.47 for 3rd. Australia versus Poland, junior versus Veteran, 17-year old Mack Horton faced off with 26-year old Mateusz Sawrymowicz coming down the home stretch, but it was the younger Horton who held on to win in 15:13.67. He’s one of a number of young, impressive Australian distance swimmers who is part of a revival of the discipline in that county, though despite placing second at their Trials this year, he didn’t hit the country’s mandated qualifying time for the World Championships. Chad la Tourette took 3rd in 15:28.22. Not a huge deal but I think it is a little weird to keep referring to Missy being a Cal Bear, the only training she has done with Teri was during national team camps. Was the 1500 qualifying time for men in Australia higher than the cut required by FINA? Honestly, I don’t understand why you don’t allow everyone to go the these international competitions if you qualify. It’s not always about the medals. It’s about the experience…which is extremely important for someone who is 17 years old. I understand when some countries who have little funding must utilize this maneuver to save on costs…but I highly doubt funding in Australia has been that tight that they can’t afford to send 2 people per event (and more for relays) to the biggest international meet of the year. Yes. The Australian guys had to swim 14.58.30 to qualify. The Fina A standard is 15.14.38. And Mack Horton actually swam 14:59.66 in the AUS trials, just over a second of Australia’s tough cuts. It’s the last time I’m asking USA swimming to post the videos of all finals on their youtube channel because I’m tired to do it. Please, think to the swimming fans outside of USA. You did it for every grand prix before Charlotte. Why not since Mesa anymore? If someone from swimswam could transmit my request to them, it would be cool, thank you, because I’m desperate. I just wonder whether they have sold television rights to a broadcasting company? Anyway, nowadays sport federations should not do that in a totally exclusive way. While alternative means of broadcasting become more common and widespread, it may harm a sport (e.g. swimming) if these exclusive rights lie in the treasury of a broadcasting company which is not willing to promote swimming. In short-term a lucrative television contract with bad coverage may be a good thing, but being visible is better in long-term. One can sell the rights of a particular event while reserve the rights to use that material afterwards if the holder of rights is disinclined to do so.